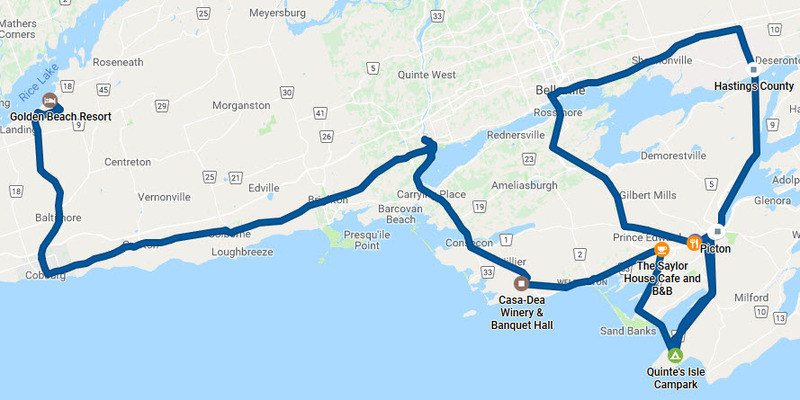 After a very slow spring at home taking care of various commitments and planning some others, we have decided to again wander back into Ontario with a target of reacquainting ourselves with some of our favourite Niagara wineries. On our way we plan= to stop in Mississauga to celebrate Lillian's brother's birthday. Lillian had some routine medical tests last Wednesday (2nd) and we originally planned to take off shortly after. Besides a dismal weather forecast for the latter part of the week, we also heard that out new sofa that we ordered some months ago was finally available for delivery on Saturday. We also received an email saying that Tom Russell was in town Saturday. We did not want to miss either event to departure was stretched to Sunday then Monday. We have some appointments on May 22nd, so we need to be back by then. Otherwise, as is our habit, serendipity is our guide! 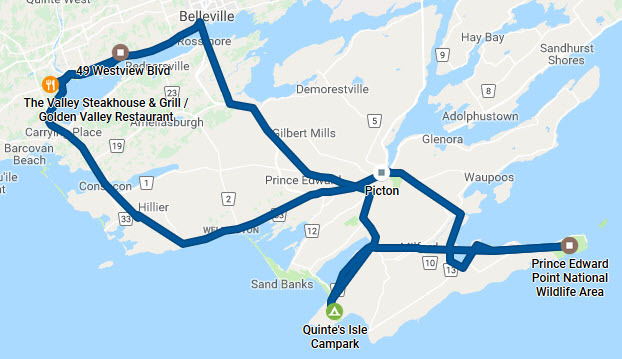 Day 10 - May 16, 2018 - Back To "The County"
The objective for today was to head into Prince Edward County to visit a couple of our favourite wineries to pick up some gifts for the Mississauga gang. We hit the road about 9:15. We made a brief stop in Dorion to grab a bite of breakfast then rolled on to Lancaster, ON to get some slightly cheaper Ontario fuel. We also made a brief stop in Brockville to pick up some Lattes at the Starbucks on Parkdale. We arrived at Waupoos Estates Wineryaround 2:15 PM. We tasted a couple of new offerings then picked up some of our planned items. We then set off for Casa-Dea Estates Winery at the other end of the county. We skinned in about 3:45 PM and had a nice visit while picking up some special items. Now to find a spot to spend the night. Our choice was Quinte's Isle Campark but we need to get there before 5 PM since the office closes early off-season. We made it with 15 minutes to spare and checked in picking much the same spot as last year. We dropped a couple of items at the site to establish our stake the headed back to Picton for some supper. We decided to revisit the The Acoustic Grill Food was excellent as usual. We chased it down with a bottle of Sandbanks Baco Noir which was also excellent if a bit young. We then headed back to camp and spent some time getting things a bit better organized. Today we are expected in Mississauga to celebrate Lillian's Brother's birthday. We wanted to get across Toronto during the mid day while the traffic on the infamous 401 was not too bad so we set out about 9:25 after a bite of breakfast. 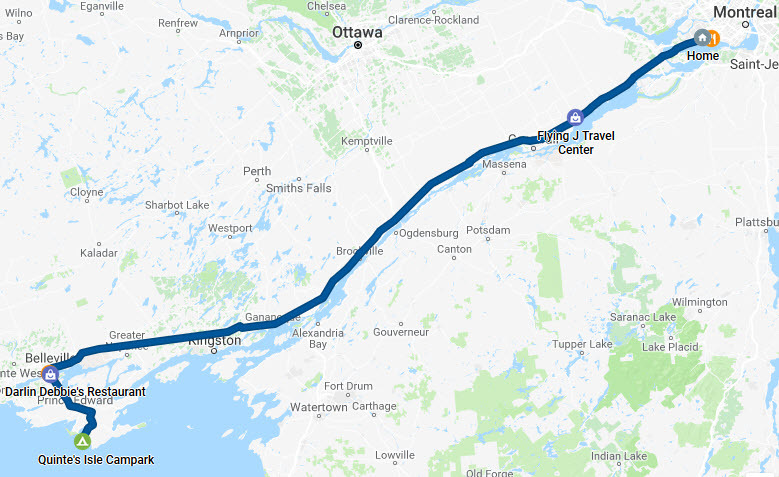 The drive was largely uneventful until we were approaching the Dixon Road exit and we found out that the 401 express lanes were blocked at Renforth with at least a 30-minute delay. We immediately exited at Dixon and followed it to Derry Road where we could head over the top of Pearson Airport (YYZ). We followed Derry almost all the way to out destination. We landed at Lillian's Brother's place about 1:15 PM. After a bit of a arrival chat we set off in their car to do a couple of small errands and ended up at Paramount Fine Foods at 5700 Mavis Road Mississauga, Ontario where we had a nice lunch to last us until dinner reservations at 7 PM. After lunch we returned to their place to relax and chat for a bit. The big birthday dinner was to be at Prince Japanese Steakhouse in Etobicoke. We set out about 6:16 and arrived with about 10 minutes. Their daughter and son-in-law were to join us. They got caught in some traffic but arrived only a bit behind. We were scheduled for a Teppanyaki "experience" which included as much show as food. I won't try to explain it here, but both the "show" and the food were first rate. We parted company with the younger folks and headed back to Lillian's Brother's place about 9 PM. We had a nice visit. The girls faded about 11 and the boys ran out his birthday before crashing for the night. Since we have a concert in Kitchener on the 10th we decided to move camp to Waterloo for a couple of days. We decided to stay at Green Acre Park in North Waterloo where we had stayed previously. We "set sail" about 10:07 and arrived at about 11:40. We picked a site near where we stayed previously. They mentioned that there were some other Roadtreks going to be there later. We did not think much of it beyond it always being interesting to meet other Roadtrekers. We next set off for Stratford where Lillian wanted to visit a wool shop she liked CloseKnit Quality Yarns as well as a favourite chocolate shop Chocolate Barr's Candies Rod took Weston for a nice walk while Lillian shopped out the area. We then stopped at the Zehrs on Ontario Street while we were in town to fill out the galley a bit. We also stopped at The Best Little Pork Shoppe in Shakespeare where Rod picked up some of their excellent smoked pork chops and Lillian grabbed some butter tarts. We arrived back about 4 PM, ordered some firewood from the office then headed off to our site. We got things set up and Rod started working on setting a fire with an eye to cooking those pork chops on it. Around 5 PM a number of Roadtreks started rolling in. By the time they were done there were about a dozen. It seems that we had fallen into the "students" of a Roadtrek Owners' Course. It was great fun meeting them and exchanging experiences. Roadtrek is located in Kitchener and the new Hymer plant is in nearby Cambridge so it seems they too like Green Acre Park as a good camp site in the area. We eventually managed to cook and thoroughly enjoy our pork chops then enjoyed visiting with the Roadtrekers. Quite an interesting surprise! We headed back south at about 3:25 PM and worked our way directly to Centre In The Square where the show was to be held. Once there we found some parking for the Roadtrek then headed over to Crabby Joe’s Bar & Grill for a quick dinner before the show. The show was Nitty Gritty Dirt Band who we have followed for most of their 52 years. The show was excellent. The opening act was good (JJ Shiplett from Calgary) then, after a short intermission, the NGDB came out and gave an energetic, generous two-hour show that had the whole place rocking. Jeff Hanna, fronting the band as he has in every concert for 52 years, was great. Jimmie Fadden, the other original, kept time on percussion as he always has and contributed some good vocal and harmonica solos. Bob Carpenter, the other "almost original" was great on keyboards and accordion. He also contributed some vocal leads which were great. Everyone else on stage were solid support to the team. A super concert! We got back to camp about 11:15 PM. Last night Lillian's Brother and Sister-in-law (R&A) decided they would like to join us for a couple of days in Niagara. I told them that we were booked into Niagara Falls KOA for a couple of days the same as last year. They said they would meet us at the KOA. We set out about 9:30 after a bite to eat. We headed pretty directly to the Niagara region but decided to stop first at Peller Estates Winery & Restaurant since Lillian wanted to pick up a couple of items there and she figured R&A were there often and might not be keen. Just as we got close we got a call from R&A saying they were in Niagara Falls. We told them where we were heading, and they said they would meet us there. Once we arrived at the winery Lillian headed in to shop while Rod took Weston for a tour of the estate while taking some pictures. By the time "the boys" got back to the Roadtrek A&R were parked beside us. We joined Lillian inside to catch up and plan the remainder of the day. We decided that some lunch was in order and A remembered a place called the August Restaurant to be good so we headed there for an excellent lunch. After lunch our first stop was Magnotta Winery We looked about, tasted a bit and I believe someone purchased something. We next headed for Hernder Estate Wines This was on our list to at least pick up some of their Cabernet Franc which is excellent and reasonable. Amongst various other procurements Lillian and I picked up 6 of the 2012 Franc. As usual, we had a nice chat with the folks there who are always especially pleasant. We then headed back to Niagara Falls where we split up to check in to our various accommodations. When we arrived at Niagara Falls KOA we found a lineup to get in. It seems it was their "Care Camps Big Weekend". This is a big event for Mother's Day weekend to raise funds for the KOA Care Camps It was a good deal for us. Since we were staying the Friday we got the Saturday for $20 which was donated to the Care Camps. They got us checked in quickly, so we headed to our site way in the back of the park. It was very handy to washrooms and showers but basic beyond that. We got set up and relaxed for a bit. Rod took Weston for a tour of all the action while Lillian relaxed for a while longer. R&A picked us up about 7:30 PM and we headed to Casino Niagara Once we got parked and inside "the girls" decided to spend half an hour making some donations to OLG (Ontario Lottery and Gaming) while the boys scouted a solution for dinner and discussed life over a glass of wine. We then went for dinner at LEV2L Sports Bar where food was decent and reasonable. The only problem was the generosity - portions were pretty massive. We got back to the KOA about 11 PM and settled in for the night. A slow rise to a nice pot of coffee while we waited to hear from R&A. It had rained overnight, and morning dawned cloudy and cool. R&A picked us up about 10:30. I had picked The Regal DinerWhile it is a veritable "hole in the wall", the food is locally sourced and excellent and the staff charming. Our first winery for the day was Chateau des Charmes. Lillian and I had picked up some of their wines at the LCBO and were interested in seeing the source. We had particularly noticed their Aligoté which we did not know was produced anywhere in Canada. Aligoté is a rare vitis vinifera variety native to the Burgundy region of France. We had tasted theirs and we were quite impressed. We picked up some more to enjoy. Not far from there we stopped at Colaneri Estate Winery We had not been here before an= d were delighted to find that they did most of their wines are made in the appassimento style. The word “appassimento” means withering. Essentially some portion of the grapes for each wine are dried before processing. We have run into a number of wines done in this style in the last few years and we find the result if often very interesting. These wines are a bit more expensive due to the extra processing and loss in volume in the dried grapes. From there we worked our way through Konzelmann Estate Winery, Strewn Winery and finally Jackson-Triggs Niagara Estate Winery All were interesting, and wines were sampled. The only problem is that our palates were getting so "polluted" that it was hard to evaluate much - especially whites. We made our way ("R" was chauffeuring for the day) back to camp by 4:15. R&A stopped for a cup of tea before heading back to Mississauga. We ate some leftovers from the galley and just relaxed. Rod actually started getting this document caught up. Sunday morning! Time to groom the beardie. After some breakfast I put the carpet from the van entrance on the picnic table and Weston promptly climbed up for his weekly makeover. It was lovely morning from dog grooming and it is always good to see the lad looking all handsome for a few minutes before he heads off to roll in the grass or worse. The plan for the day was some shopping in Niagara On The Lake if for nothing else than to visit Greaves Jams & Marmalades to resupply with some of their fine product. We used to make our own but we would rather be off Roadtreking, so this is a close as you can come. The town was pretty busy being a beautiful Mother's Day Sunday. We managed to find parking and spent a couple of hours reacquainting ourselves with the town merchants. We next headed to Fort George National Historic Site We had been wanting to drop in before when in the area but often were with folks who were less historically inclined. We spent an hour and a half wandering the site and chatting with the guides. Lillian had mentioned that she would like to add one more winery to our itinerary, so we set off for Tawse Winery They were slowing down for the day, so we had time to chat and sample a number of their wines. We picked a couple "for further analysis" before heading back to camp. We got back just before 6 PM and picked up some firewood on the way in. We spent a quiet night at an almost deserted camp. Dinner was hamburgers cooked on the camp fire chased with some yeast-contaminated grape juice. The day started with some cute silliness. Lillian was up with Weston as usual and was sitting in the RT after their morning out when she noticed a brilliant male cardinal sitting on the passenger side mirror of the RT. What's more it was periodically jumping off the mirror and hovering in front of it trying to encounter the other male cardinal he could see. She woke me up so I could see and confirm she was not imagining it. She also managed to get a couple of pictures on her cell phone. They will eventually get posted below. It was quite the show. We had a leisurely breakfast and managed to get on our way before they booted us out at 11:00. We took a stop on the way out to dump "the ugly tanks" then made our way to St. Catharines Museum and Welland Canals Centre to acquaint ourselves with the history of the are and the canal in particular. The museum is situated at lock 3 of the current canal. 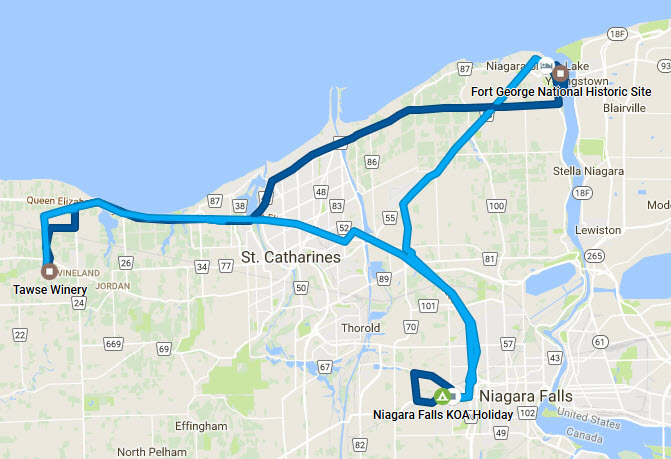 There was not too much action for the next few hours so, after a tour of the museum, we drove along Welland Canal Parkway along past several locks to the Lock 7 Viewing Complex where we were able to watch a ship heading down through the lock. After the canal visit we made our way pretty steadily up to the Barrie KOA The trip was uneventful other than a point where we were moving along the 401 to where we picked up the 400 heading north. When we were moving we kept hearing a sound like gravel hitting the windshield. There was no visible source to the sound and it stopped when we stopped in traffic. We were wondering if it was coming from the engine compartment though all indications were that the engine was running normally. Then Lillian solved the problem. A nearly empty plastic water bottle had rolled under the accelerator peddle and was making the sound when pressed. We had a great laugh over the "water bottle gravel". On the way in we picked up a BBQ chicken for dinner which we enjoyed the spent a few pleasant hours solving the world's problems around the campfire. A less exciting day today. We set out about 10:42 without any cardinal entertainment. It had rained overnight and continued intermittently. The fist stop for the day was Tanger Outlets near Cookstown. Rod worked on some trip planning and did some reading while Lillian checked out a number of interesting shops. We were there for about an hour and a quarter before heading on our way. It rained on and off while we made our way over toward Peterborough. We stopped there briefly to see if the Peterborough Lift Lock (part of the historic Trent-Severn Waterway) was operating - no luck. From there we beat a path to Golden Beach Resort one of our favourite stops when we are in the area. Their restaurant, The Boathouse, was closed so we dined from the galley and Lillian did some laundry and Rod finally got this document up to date. We rose to a lovely morning though just a bit cool. We had a light breakfast from the galley while contemplating the day. We decided to head down to route 2 near Cobourg then head east in a leisurely manner. We set off about 9:50 to do exactly that. We were initially thinking that we may stay at the west end of the county until we remembered it was Wednesday and the bi-weekly "Kitchen Party" was on at The Barley Room at the The Waring House in Picton so we headed right in to "The County". Our first stop in the county was Casa-Dea Estates Winery where we exchanged a slightly leaky bottle of Cabernet Franc with no problem. We then worked our way over to Bloomfield where Lillian reacquainted herself with the main street shops before we crossed over the street for some lunch at The Saylor House Cafe. While we were there we picked up a half-loaf of their outstanding marble rye bread. We then headed back to Quinte's Isle Campark (same place we stayed day one) and registered a camp site for the night. From there we headed off to Picton for Lillian to drop into the wool store that was closed on the last pass. 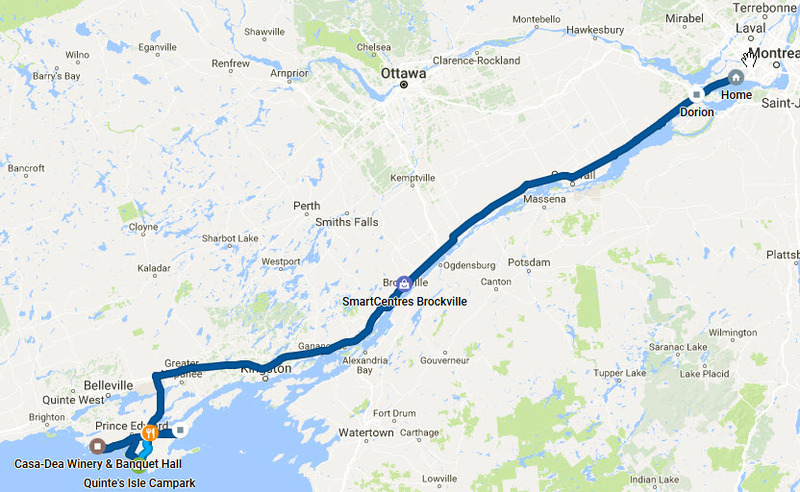 We then decided to take a run up to the Tyendinaga Mohawk Territory for some more economical fuel for the RT. We headed right up 49 from Picton to get there but looped back along route 2 to Belleville and returned to the county over the bridge on route 62. When we arrived back at Picton we stopped briefly at the Home Hardware before heading back around the traffic circle to the The Waring House. After taking Weston for a tour of the site we headed into the Barley Room Pub for a decent dinner and an evening of good music. We got back to camp about 10 PM and settled in for the night. Yesterday we had been in touch with the widow of Lillian's cousin (M) who lives near Belleville. We had arranged to get together today for lunch or dinner at Boathouse Seafood Restaurant & Waterfront Patio, a favourite amongst us. Upon checking the website, we discovered it was closed for renovations, so it was a scratch. I decided to look for an alternate plan and picked Golden Valley Restaurant which is in the process of rebranding themselves as "The Valley Steakhouse & Grill" under the same ownership. We contacted M after breakfast to check our suggestion and arrange timing. She confirmed that it was a good choice and a favourite of theirs over the years, so we arranged to meet at her place, which is conveniently between Belleville and Trenton at about 4 PM. Having most of the day free we decided on some nature so headed for Prince Edward Point Bird Observatory which is in the Prince Edward Point National Wildlife Area at the south eastern point of Prince Edward County. This is peak migration season and the county is a prime stopping off point as birds come across Lake Ontario. We set off about 11 AM after letting the camp know we were staying an additional day and arrived about 11:50. We spent a couple of hours wandering around, chatting and watching birds trapped earlier in the day be examined, recorded and banded. One of the gentlemen working on the survey discussed some of the species and showed us a number of birds just before releasing them. Since they were wrapping up for the day and since the bugs were driving Lillian a but buggy, we headed off. Lillian still wanted to stop at Zest Kitchen Shop in Picton which was closed when we were there yesterday, so we headed back there. We spent about 40 minutes poking around and letting Weston out for a walk. We decided that we would head to M's place with a stop at Sandbanks Winery to pick up a few bottles to bring home. We arrived at M's about 4 PM as planned and sat out on her deck and shared a bottle of wine while we caught up on the family news from both sides. We headed off to Golden Valley Restaurant about 5:15 arriving about 15 minutes later. We had no problem getting a seat. Lillian and I opted for their prime rib roast while M chose fish and chips. The roast was superb - one of the best since the demise of Magnan's about 3-4 years ago. The service and veggies were also first rate and the price reasonable. We will be back! After a leisurely dinner we dropped M off at home and made our way back to camp before dark. Since Lillian has an appointment on the 22nd, a long weekend is starting and the weather forecast is not exciting we figure today is a good time to mosey our way back home. We expect to be back on the road in a week or so. We pulled out from camp about 9 AM once we could drop off the gate card which we never needed. We headed for Belleville stopping just short at Darlin' Debbie's for a bite of breakfast. Rod loves their homemade corned beef hash. We then headed along route 2 to the Tyendinaga Mohawk Territory for some cheaper gas before heading on to the 401. 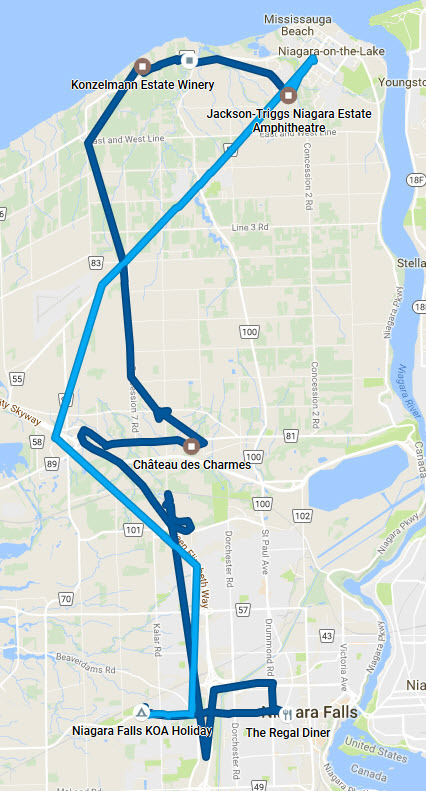 Most of the trip home was pretty routine. We stopped in Brockville for some coffee and a quick stop at the LCBO. We also stopped at Lancaster to top up the fuel tank before we hit Quebec prices.